Having lived in the shadow of Cartagena for many years, Santa Marta is now emerging as a serious contender to the crown of Colombian tourist capital. 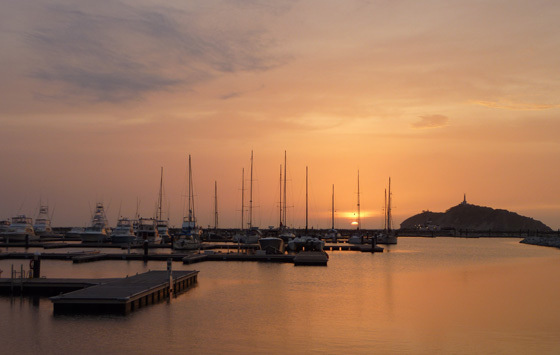 While Cartagena serves as the Caribbean coast's main attraction for package tourists and anyone else with relatively deep pockets, the Magdalenan capital and the surrounding region has emerged as the coast's most popular destination for backpackers and budget travellers. Guide to accommodation in Santa Marta, from the cheapest hostels to the most luxurious boutique hotels. Guide to the local soccer team, Union Magdalena, as well as its most famous export; Carlos Valderrama. A guide to the city's exciting nightlife. Advice on the best bars and clubs in which to dance (and sweat) the night away. A guide to the city's cuisine. Advice on the best restaurants and eateries in the city as well as some of the region's typical dishes. Guide to getting to, around, and away from the city. Includes advice on taking buses to Venezuela. Here, prices are more affordable and the region's beauty is at least as impressive as in the Cartagena area. Santa Marta and the nearby towns of Rodadero and Taganga abound with hotels and hostels, restaurants, bars and nightclubs to satisfy budgets from shoestring upwards. Just an hour or so east of the city, the splendid beaches and jungle of Parque Tayrona draw many travellers, although not so many as to damage the feeling of 'getting away from it all'. The number of toursits visiting the Caribbean coast of Colombia increases year on year and efforts have been made to improve the infrastructure of the regions two principal tourist centres, Cartagena and Santa Marta. In the last couple of years the city has changed its face even more than Cartagena, in particular the beachfront and the area around Parque Santander. Of particular note is a large new tourist port which was opened in 2010 at the Rodadero end of the city's main beach. 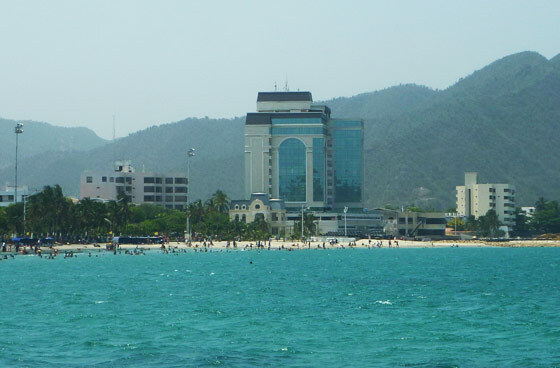 Most of the attractions, hotels and restaurants of the city lie between the beachfront and Carrera 5 (also called Avenida Campo Serrano). The beachfront is pleasant, although the beach itself is not. By the end of day the narrow strip of sand is typically covered in a variety of litter. Better to save your beach sunbathing for the stunning sands of Parque Tayrona. On Carrera 1 (the beachfront street) there are many restaurants offering various dishes including, of course, a range of delicious fresh fish. Prices on the beach strip are above average. At night the atmosphere becomes lively as the restaurants turn into bars and music fills the street. About halfway along Carrera 1 is Plaza de Bolivar, the city's main plaza which streches back for two blocks. It's an attractive place with plenty of shade providing relief from the strong Caribbean sun. Pretty much every town and city in Colombia, and indeed in much of South America, has a Plaza de Bolivar, but in Santa Marta it is particularly poignant as it was here on 17 December 1830 that the great liberator Simon Bolivar died. 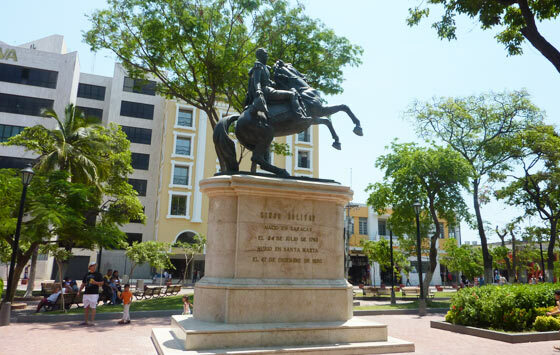 Bolivar's remains were transfered to his birthplace of Caracas, Venezuela, but a statue in the centre of Plaza de Bolivar depicts the liberator on horseback. Opposite Plaza de Bolivar on the beach promenade is a monument to Rodrigo de Bastidas, founder of Santa Marta back in 1525. The plaza is surrounded by all of the major Colombian banks. On the Calle 14 side of the plaza you can also find the Museo del Oro (the Gold Museum) and the Alcaldia (Mayor's office) housed in a large yellow colonial building. Walking one block up from Plaza de Bolivar brings you to Plaza de la Catedral upon which sits the whitewashed Cathedral that claims to be the oldest church in Colombia. Four blocks south of Plaza de Bolivar lies Parque Santander. The area has recently been remodelled and pedestrianised and at night young people congregate in the park and in the street bars that surround it. About 4km from the city centre is Quinta de San Pedro Alejandrino, the hacienda where Simon Bolivar spent his last days and died. It is now a tourist attraction and has been converted into a small museum. There is also a pleasant botanical garden within the grounds.